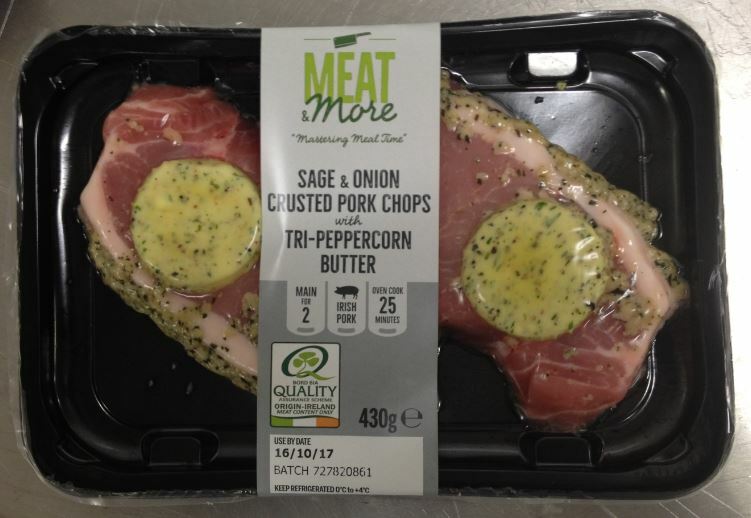 Here’s another treat for you all to try at home…..Meat & More have just released another super tasty ready to cook meal with Aldi – Sage and Onion Crusted Pork Chops with a Tri-Peppercorn Butter. It’s absolutely delicious and because it’s ready to cook it takes the hassle out of your evening. At the Culinary Food Group all our products are created by a team of top chefs that focus on taste and nutrition. This latest product has been developed by our fab chefs in our in-house Innovation Centre. It gives you all the flavour of a restaurant quality dinner with minimal effort in your own kitchen. The pork chops have an and added value culinary edge with a delicious sage and onion crumb coating on the chops and two accompanying slices of tri-peppercorn butter – simply pop them in the oven and they’re ready to serve. All our pork is 100% Irish and Bord Bía approved and our chefs carefully select the best natural ingredients, making all aspects of the ready to cook meal from scratch on site. We don’t use anything that you wouldn’t find in your own fridge or cupboards which means everything is authentic and packed full of flavour. The twin pack is sealed using the very latest skin packing technology which keeps the pork fresh during storage. Ready to Cook – On the Up! Meat & More focus on the demands of a modern consumer who’s under extra time pressure in the evening. The idea of ‘ready to cook meal solutions’ have become particularly popular over the last year and we are seeing more and more demand from the market place. For a long time, consumers have been searching for a way to make their evenings a little more relaxing but be confident they are able to tuck into a wholesome and nutritious meal. Ready to Cook is a solution that ticks all the boxes. Being able to provide consumers with convenience and quality products is what it’s all about and why it’s been such a busy 12 months for Meat & More. We recently won first place for high potential start up and have launched new burgers with Dunnes Stores along with range of ready to cook chicken products with Aldi. All of our new meal solutions have been a real hit in the market place. We’ve lots More Meaty delights on the way to make sure that we continue to help “Mastering Mealtime” with a stress-free evening – so you’ll have to watch this space! If you’re interested in creating ready to cook meals or want to learn more, why not get in touch? Our chefs love to experiment so we’re sure we can create something delicious together.